This work is licensed under a Creative Commons Attribution 4.0 International License, except where otherwise noted. A proposed new presidential policy on open access theses and dissertations is open for system wide review until February 28, 2018. All members of the UC community are invited to comment on the draft policy. 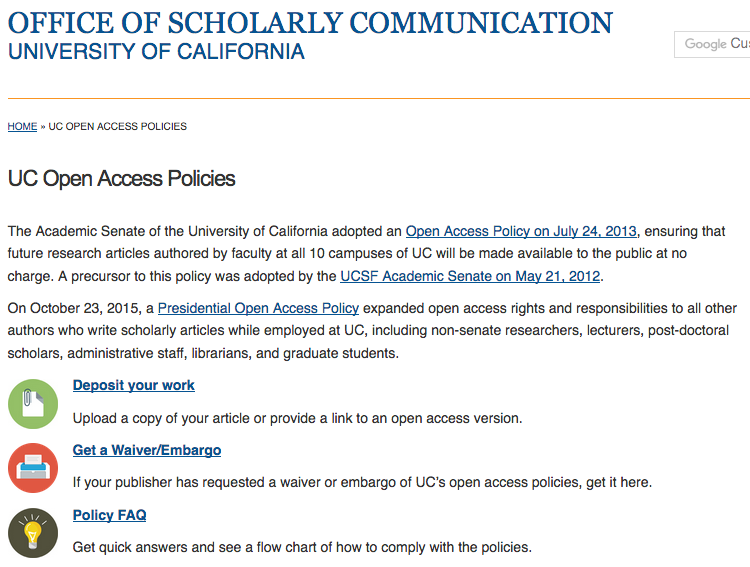 Visit the UC Academic Affairs website to read the draft policy, a cover letter with instructions on where to send comments, and a set of Frequently Asked Questions. Build your data management plan. For help with DMPs, data repositories, and data management. Provide your research and scholarship in open access and satisfy UC and funder open access policies. In addition, you works will be cited more often and be accessed more widely. Contact us for personalized support in navigating the best options. questions or for assistance in collecting your work in eScholarship.